Save time and money by creating your own personalised self-inking stamps. With the new Super S-600, you could create and keep up to six of the your most frequently used texts on plates ready to go. 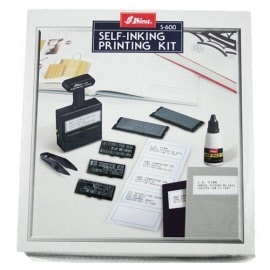 Kit contains: 1 Printing Stamp, 1 pair of tweezers, 1 bottle of black ink, 2 ink pads, 6 removable plates and 3 different type sizes (3 mm, 4 mm and 5 mm) in caps. Uses Shiny™ S-824-7-9 replacement ink pads.